The Baltimore Symphony Orchestra’s (BSO) OrchKids™ program announces a collaborative community concert, part of the Creative Connections Project, on Saturday, March 24, 2012 at 3 p.m. at City Neighbors High School. Guest artists include London musicians Ross McDouall, Heather Truesdall and Sam Mumford and program directors Jill Collier and Daniel Trahey. 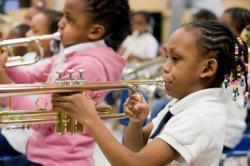 The Baltimore Symphony Orchestra’s (BSO) OrchKids™ program announces a collaborative community concert, part of the Creative Connections Project, on Saturday, March 24, 2012 at 3 p.m. at City Neighbors High School. Guest artists include London musicians Ross McDouall, Heather Truesdall and Sam Mumford and program directors Jill Collier and Daniel Trahey. OrchKids community concerts are funded by the Paul M. Angell Family Foundation and showcase the program and its students’ significant musical accomplishments with the broader Baltimore community. Please see below for complete event details. The Creative Connections Project incorporates various Baltimore arts organizations, schools in Baltimore City, Peabody Institute and the United Kingdom’s Guildhall School of Music and Drama to provide musical experiences by encouraging creativity and collaboration between music communities and individuals. The project employs collaborative composition, improvisation and group activities to engage participants in the creative process while taking into consideration each individual’s voice. This concert is a culmination of musicians from the OrchKids, Baltimore School for the Arts, New Song Academy, Peabody Institute of Johns Hopkins, and three visiting musicians from London’s Guildhall School of Music and Drama. The project will begin with a launch event on Monday, March 19 where all participants will be introduced to the project and begin the process of creating music all together. The musicians will rehearse in their school/ensemble to create their own material to bring to the larger group. OrchKids is a year-round after-school music program designed to create social change and nurture promising futures for youth in Baltimore City neighborhoods. Under Music Director Marin Alsop’s artistic leadership and direction, OrchKids is a cornerstone of the Baltimore Symphony Orchestra’s efforts to expand the Orchestra’s relevance within the City’s broad and diverse community. In collaboration with several community partners, including Baltimore City Public Schools, OrchKids provides music education, instruments and performance and mentorship opportunities at no cost to Baltimore’s neediest youngsters. The program is inspired by Venezuela’s El Sistema, the music program that in 30 years has transformed the lives of hundreds of thousands of children in that country’s most impoverished areas. Like El Sistema, OrchKids is intended primarily to address the most pervasive social challenges affecting underserved youth, using music to cultivate fundamental life skills such as self-expression, cooperative learning, discipline and creativity. With assistance from The Family League of Baltimore City and the University of Maryland Baltimore County’s Shriver Center, the BSO has implemented several assessment tools to track participant’s social achievements and academic and musical outcomes. In the 2012-2013 school year, OrchKids will serve more than 400 pre-K through fifth grade students at Lockerman Bundy Elementary School, Mary Ann Winterling Elementary School, New Song Academy in West Baltimore and most recently, Highlandtown Elementary/Middle School, #215, in East Baltimore. Under OrchKids Director of Artistic Program Development Dan Trahey, students receive classroom music instruction, group instrument lessons, tutoring assistance and even a nutritious meal, courtesy of East Side Entrees. OrchKids frequently have the opportunity to take field trips to local organizations and regularly attend Baltimore Symphony Orchestra concerts. Note: this concert is free and open to the public.